With Black Canary out for blood (especially Black Siren's) in the wake of Vigilante's death, Oliver finds himself faced with the dual problem of capturing Cayden James before Star City is destroyed and keeping his enemies from being killed by his former allies. Why does Wild Dog of all people object to Dinah's quest for vengeance? For that matter, why don't Curtis and Rene offer to help Dinah with her hunt for Black Siren? Even if they don't want to see her die as badly as Dinah does or object to killing for moral reasons, finding Black Siren could put them closer to finding Cayden James' bomb. Where the heck is Cayden James driving if all the ways out of Star City are sealed off and the only way out of the city is by flying? For that matter, why would the notoriously paranoid James bother to turn off whatever is stopping his phone from being tracked in the final hours of his plan? Ricardo Diaz has to be the worst criminal mastermind ever. Supposedly he set up this whole conflict between Green Arrow and Cayden James as a means of taking over the city, yet didn't have any mechanism in place for stopping Cayden James from following through on his plan to blow up the city. Only Team Arrow coming together - despite their fractures - managed to keep his whole plan from falling apart, even though his entire plan is dependent on the team being fractured! It's a subtle thing, but kudos to Willa Holland looking around and being careful about what she says in a crowded room as she is talking about Team Arrow business. It just hit me that I don't think any other actor on their phone in public has been doing this all season, though I might be wrong. Likewise, there's a brief moment of David Ramsey seeming to steady himself during the bit where The Flash takes Green Arrow and Spartan to cut off Cayden James. This is a nod to the running gag of how travel at super-speed usually makes John Diggle throw up. Michael Emerson's performance as Cayden James is Emmy-worthy. There's some nice parallels in the script between Oliver's trying to keep William safe from his life in the present day and Cayden James doing the same 18 months earlier. The episode title comes from a quote from the movie The Usual Suspects - "The greatest trick The Devil ever pulled was convincing the world he didn't exist." The character of Ricardo Diaz was introduced to The New 52 reality in Green Arrow #23 (October 2013) by Jeff Lemire & Andrea Sorrentino. Using the alias Richard Dragon in honor of his mentor in The League of Assassins, whom he killed, Ricardo Diaz Jr. was the son of Ricardo Diaz Sr. - a corrupt Seattle businessman, who was killed by John Diggle who was, at the time, posing as Green Arrow. Seeking revenge, Diaz Jr. went off in search of The League of Assassins. After killing his mentor and taking his name, the new "Richard Dragon" returned to Seattle and began killing gang-leaders while posing as a vigilante. In truth, "Dragon" was cementing his control on the underworld with the ultimate goal of killing Green Arrow and taking over his city. To that end, Diaz formed a team - The Longbow Hunters - dedicated to killing Green Arrow. The DCTVU version of Ricardo Diaz is a career criminal who goes by the street name "Dragon". Once part of a Glades gang called The Scorpions, he was sentenced to Life Without Parole twice for his extensive list of crimes. His convictions were overturned due to technicalities and he has only been out of prison for one month, according to Dinah in 606. Felicity and Curtis a photographic analysis algorithm for examining altered photographs. It works wonders on a single still image, but is limited in how quickly it can scan 24 fps video. Using the metadata on the video file, Cayden James confirms that the forged video was made by someone within using the same technology used to make the doctored photo of Oliver Queen as Green Arrow. Cayden James had a hacked ARGUS transponder 18 months ago. Cayden's detonator emits a 76-gigahertz field. This means that it can deactivate Black Siren's power inhibitor collar. Green Arrow: You need to know something! Cayden James: Many things, I'm sure, but I doubt very much that you're the man to teach them to me. Thea: I noticed that Dinah didn't show up to work today. Quentin: Well, after what happened to Sobel, were you really expecting her to? Thea: No, I just... if, from what Oliver told me, I... I don't really think that she's exactly just grieving. Quentin: You think Oliver would just, what, let Dinah kill her? Thea: No, I... I just don't think that that's what's on his mind right now. Quentin: Right. (pauses) Well, if it comes down to Laurel against Dinah... Laurel's not the one I'm worried about. Cayden James: I'd like to speak to my former colleagues. And that's where the two of you come in. Green Arrow: No! We're not rounding them up to be executed! Cayden James: No. I just want a pointed conversation. Bring them to me. All three. Alive. Otherwise I'll have no choice but to stay the course. I still have a very powerful bomb and I'd be perfectly happy to take out Star City right along with whoever orchestrated the death of my son. Black Canary: What are you doing? I had her! Green Arrow: I'm saving the city. Black Canary: I cannot believe you are working with Cayden James. Wild Dog: It's not like that, D.
Spartan: He wants Anatoly, Diaz and Laurel. Alive. Mr. Terrific: Or "boom goes the city." Just saying that's a pretty good reason to not kill her besides, you know, all the other good reasons like "killing is bad." Black Canary: I can hold off for a little while. Green Arrow: Dinah, we do not just execute people. Black Canary: No. You just let them die. Black Canary: I'm counting down the minutes. Quentin: What, before you try to kill my daughter again? Black Canary: That is not your daughter! That is a monster! Quentin: You gave your monster a second chance. Quentin: I know. I know what she's done. I'm not an idiot. But no one deserves to die. Not even her. Black Canary: You're wrong. And once this is all over, if Cayden James doesn't kill her, I 'm sure as hell am gonna take my shot. Anatoly: City is about to become crater! You want to put me in prison?! Fine! (pauses) Just... out of town, please. Green Arrow: The bomb's not going to to go off, Anatoly, because I am going to deliver Cayden James the truth - You! Anatoly: You have finally snapped! (pauses) Took a few more years longer than I expected. Green Arrow: Your son wouldn't want you to do this. Cayden James: The person responsible for his death is in the vicinity. And I intend to drag them to Hell with me. I owe it to my son. Green Arrow: You don't have to be afraid, all right? I'm right here with you. And I love you very much. Cayden James: William... I had an obligation to protect my son.It's a father's job - protect your child. But I failed.... I failed him. Utterly. All this time... the man responsible for his death... was me. Alena was recruited into Helix 18 months before the events of this episode (Approximately August 2016) At the time, Cayden James had just completed a hack of the financial records of a corrupt company - Averwood Pharmaceuticals. Star City High School's mascot is The Gators. Owen Post was a basketball player on Star City High's basketball team. Cayden James intentionally kept his son ignorant of his work. Cayden James' ex-wife was remarried to a man named Jim. Jim did not bother to invite Owen to dinner with them when he wanted to celebrate his new promotion. Capt. Hill's full name is revealed as Captain Kimberly Hill. The real killer of Owen Post was a professional assassin named Karl Iscove. Karl Iscove is dead. Oliver Queen knows this somehow. I-86 is one of the freeways through Star City. The Flash has a quick (ha-ha) cameo taking Green Arrow and Spartan to cut off Cayden James' escape from Star City. This episode probably takes place sometime after the events of F413 as Barry Allen is free to help Oliver and John. Before this episode, Barry Allen was in prison facing life in prison for the murder of Clifford DeVoe a.k.a. The Thinker. Cayden James confirms that the fake video of Green Arrow killing his son was made using his tech. The same technology was also used to make the fake Green Arrow picture from 601. Spartan refers to the death of Sheck in 611. James says he doubts he was the culprit. Cayden James was arrested by ARGUS 18 months ago, the day after Alena joined Helix. This was also the day of the finals game his son was playing in. Dinah has access to a metahuman power inhibitor collar that was "taken off of another murderous pair of dopplegangers". This appears to be one of the collars used by Earth-X Oliver Queen and Earth-X Kara Zor-El during Crisis on Earth-X. Anatoly repeats his denial from 602 of being involved with outing Oliver's secret identity. Cayden James is arrested. Diaz, Anatoly and Black Siren all escape. Oliver tells Cayden James that he hopes his surrender isn't part of some ploy, saying he's had bad luck with that tactic in the past. This is a reference to both Slade Wilson's arrest being part of his plan in Season 2 and Adrian Chase's surrender in Season 5. Cayden James embezzled all the city's funds Oliver sent him to a bank in Corto Maltese. He gives Oliver his best guesses as to where to find Diaz, Black Siren and Anatoly. All he asks for in exchange is for a chance to visit his son's grave and for Oliver to be a better father than he was. It is revealed that Quentin Lance helped Black Siren to escape after she was shot by Black Canary. 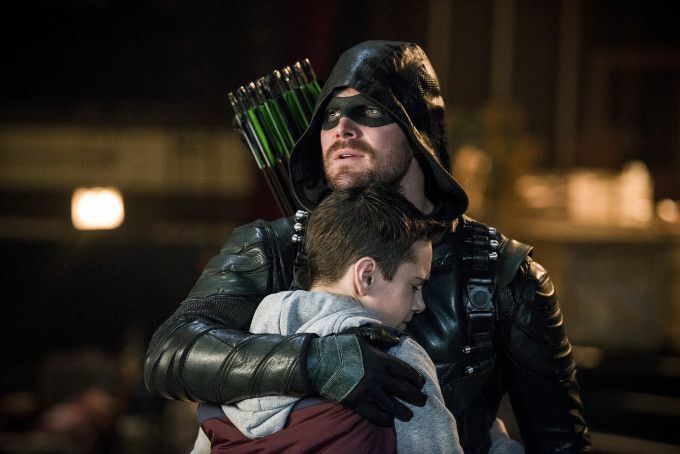 Ricardo Diaz is revealed to be the one who set up the conflict between Cayden James and Oliver Queen. Captain Kimberly Hill is on Ricardo Diaz' payroll. Ricardo Diaz kills Cayden James. The flashbacks to Cayden James in Helix Headquarters take place 18 months before this episode. Quentin and Laurel's characters are both derailed for the sake of the stupid Black Siren redemption arc. Crap on a cracker, made tolerable only by some excellent acting. The script is Winnickian in its stupidity, with villains who have brilliant plans that put them three steps ahead of the heroes at all times and any victories the heroes have all being part of the plan.The Black Siren redemption arc has now derailed two great characters - Dinah (who is turned into an illogical, murderous harpy to make Faux Laurel seem less evil by comparison) and Quentin (who is now committing multiple crimes helping a wanted murderer escape justice because he wants his baby girl back). Shockingly, that isn't the worst aspect of the episode. That would be the "surprise" reveal that isn't that surprising, given that we know Black Siren isn't smart enough to have done the work required and Anatoly - ignoring his code of honor - didn't have any reason to turn against Oliver when this plan to strike against him started. By process of elimination - and his being the least developed villain - that means that Diaz has to be the traitor to Team James... but given his goals of running the city, that makes him helping James and not having an out on the plan to blow up the city all the more illogical. All I know is that this show is going to have an uphill battle trying to redeem itself when it returns on March 1st. As of right now, I'm firmly with the camp of fans who say this series should have stopped with Season 5 like they planned.